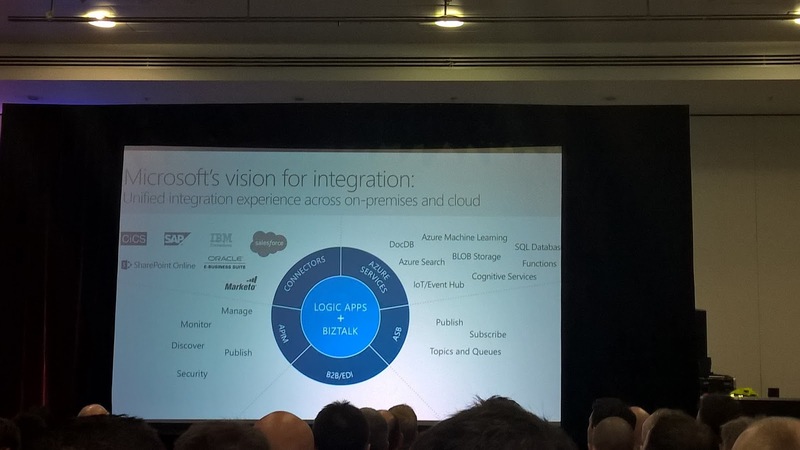 Microsoft is bringing the technologies around integration together in their vision for integration. API Management, Logic Apps, Connectors, Service Bus, and BizTalk are shaped into a hybrid type of platform. BizTalk and the logic apps form the heart in their vision to provide a seamless hybrid experience. Jim Harrer, the new PM for integration, shared the vision, services, and roadmap with us today at Integrate 2016. This event is the only integration focused event worldwide in the London Excel. Below the picture that tells it all. And around BizTalk will see a release of the CTP2 version soon, including a first version of a logic app adapter, which will broaden the connectivity spectrum of BizTalk. The vision shows Microsoft commitment in the integration space. Many thought that the BizTalk product was on life support and that there was no integration story. Well there is one and the roadmap shows a lot of promise. And what Microsoft has planned for us can be seen in the next picture. The Visual Studio Integration is one of the much anticipated features that many integration professionals cheered. And it shows a good step forward. The product team shows what investments the Product team is making, which will enhance our confidence in integration with Microsoft technologies. 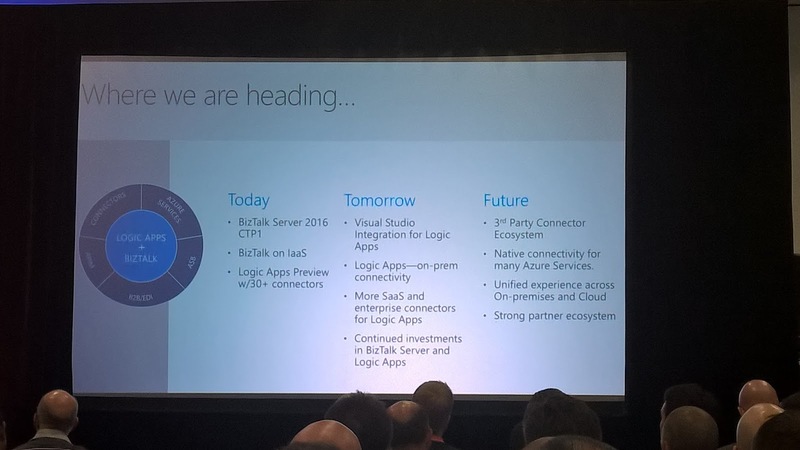 Integrate 2016 started with a blast and demonstrates that this is event is much needed to reestablish Microsoft as frontrunner in the integration space and that their technology and services are very relevant. Thanks BizTalk360, their team, MVP’s, the attendees and Microsoft for making this event happening.